“So TBOSS got to the final. Anyways I know she will win as the whole thing don be like this. 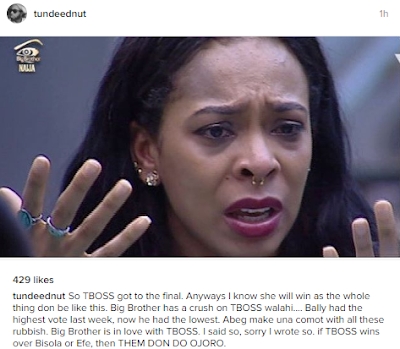 Big Brother has a crush on TBOSS walahi…. Bally had the highest vote last week, now he had the lowest. Abeg make una comot with all these rubbish. Big Brother is in love with TBOSS. I said so, sorry I wrote so. if TBOSS wins over Bisola or Efe, then THEM DON DO OJORO.” he wrote.